• In 1996, an inter-departmental government taskforce identified a looming shortfall in construction sand supply. • By 2005, no new major sources of construction sand to service the Sydney region have been approved. • By 2010, the projected shortfall is estimated to be in excess of 40% of Sydney's requirements (despite optimising the use of manufactured sand). • Sydney Construction Materials' Newnes Junction project will meet 40% of the projected deficit in construction sand, and will be a major supplier of glass sand and industrial Kaolin for the Sydney market. Many of the sand/sandstone deposits contributing to the current supply of over 6.5 Mtpa to Sydney are rapidly approaching depletion. Supply of over 0.5 Mtpa from Elderslie, Agnes Bankes, Londonderry, and Menangle will be depleted by 2006. Supply of over 4.1 Mtpa from Kurnell, Penrith Lakes, Stockton, and the Hawkesbury & Nepean Rivers will be depleted by 2010. Moreover, current supply from the Somersby and Newnes Plateaux, and the Southern Highlands is capped at 1.4 Mtpa by road transport consent conditions. The following table outlines Sydney Construction Materials' understanding of the construction sand demand and supply equation for 2010. What this indicates is that in 2010, there will be a 2.4 Mtpa shortfall of construction sand into the Sydney market. At full production, the SCM Project will provide 48.5% of this deficit. These figures, however, are based on current demand figures, which assume zero population growth. If figures based on projected 2010 populations are used², the deficit, as discussed in the table below, will be even greater. Irrespective of the level of production of manufactured sand, there will remain a significant requirement for virgin natural sand to meet concrete specifications. Industry experience shows a requirement of 1 tonne of natural sand for each tonne of manufactured sand from igneous rock sources. In view of the projected shortfall above, the Sydney Construction Materials Newnes Junction Sand extraction and Kaolin mining proposal will, at full production, produce of 1.1 Mtpa of construction sand. This will amount to between 34.4% and 38.6% of the construction sand shortfall estimates outlined in the tables above. In addition to this, the Sydney Construction Materials Project is capable of supplying all of Sydney's glass sand requirements - a task requiring some 200,000 tpa of fine-grained, low-iron sand. Glass sand is currently used by two major glass manufacturing plants in Western Sydney at Ingleburn and Penrith. The availability of a competitive long-term supply of glass sand will enable those plants to compete fairly against projected low-cost imports. Subject to the approval of SCM's Newnes Junction project, it is anticipated that full production would not be reached until 2010. This takes account of the long approval time needed for such projects, the approval and construction of a Sydney-region Kaolin and sand processing plant, and acceptance by the market of a major new supplier. 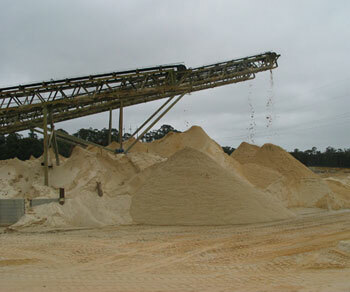 ¹ Production of manufactured sand is dependent on production of coarse aggregate. A large portion of the current Sydney demand for coarse aggregate is supplied from the Penrith Lakes Scheme (3.2 Mtpa), which is expected to be depleted by 2010. This source will be replaced by the crushing of hard rock. Production of coarse aggregate in this way is about 70-75% efficient - the remaining 25-30% is called crusher dust and is used as manufactured sand. To produce 3.2 Mtpa of coarse aggregate, 4.6 Mtpa of hard rock must be crushed (3.2 ÷ 70%). This in turn produces a maximum of 1.4 Mtpa of manufactured sand. ² Pienmunne, J. T. & Whitehouse, J., Supply and Demand for Construction Sand in the Sydney Planning Region, NSW Department of Mineral Resources, May 2001, p. 38. An average consumption of 1.611 tpa per head of population is used. ³ This is the proportion of the predicted shortfall that would be met by the SCM Project, when it gains approval.